L.A. is formulating regulations to manage dockless bikeshare. LimeBike photo by Joe Linton/Streetsblog L.A. Tomorrow the Los Angeles City Council Transportation Committee will discuss dockless bike-share, known as “DoBi”. The T-Committee agenda includes a motion (council file 17-1125), put forward by Councilmember David Ryu with Councilmember Bob Blumenfield, that calls for a dockless bike-share pilot program right away, and using the pilot “to develop a regulatory framework and permit process” for ongoing dockless operations. DoBi has become common in cities in China. The DoBi business model, similar to Uber ride-hail, has tended toward saturating markets and resisting regulation. DoBi companies push to gain market share by broadly distribute inexpensive bikes. NACTO Director of Strategy Kate Fillin-Yeh, who provided helpful background for this article, goes so far as to say some of these companies use “disposable bikes.” While ubiquitous bicycles offer low-cost mobility, Chinese cities are experiencing serious problems with large quantities of broken down DoBi bikes cluttering public spaces. Seattle and Washington D.C. tend to be cited as cities showing leadership in setting up successful DoBi operations, though even those programs remain in their infancy. Modern app-driven bike-share operations – whether smart-dock, smart-bike, dockless – are all less than a decade old. Paris’ Velib, launched in 2007, is seen as the first major modern system. Three private dockless bike-share companies – ofo, LimeBike, and Spin – are already operating in parts of Los Angeles. The city also has two municipal bike-share systems. Smart-dock Metro Bike Share is available in downtown L.A., Venice, San Pedro and Wilmington. Smart-bike CycleHop systems Breeze (which is based in Santa Monica) and Bruin Bike Share are available in Venice and Westwood respectively. Last week, the L.A. City Council retroactively approved legal agreements (council file 17-1125-S1) governing LimeBike’s operations in Councilmember Joe Buscaino’s Council District 15. LimeBike kicked off a 250-bike “pilot” in early November. In addition, the council approved an amendment that sets the stage for an additional DoBi program in Ryu’s Council District 4. Equity: If left to their own devices, for-profit DoBi companies are likely to concentrate their products in areas where they can make the greatest profit – likely tourist-rich relatively-well-off neighborhoods. One important role that the city council and LADOT can play is ensuring that pilots and ongoing operations include underserved communities. Permitting fees: Though DoBi appears “free,” even for a pilot there will be city costs. City staff will spend time permitting, monitoring permit compliance, and likely disposing of abandoned broken-down bikes. For DoBi permits, Seattle charges $149 per year, plus $15 per bicycle, and an hourly fee for permit review. Right now, these companies are eager to secure a share of the massive Southern California market, so it is important that city leaders – electeds and staff – ensure that DoBi serves the public good. The city will need to look out for underserved communities and other sometimes-overlooked constituencies including wheelchair users who require accessible un-cluttered sidewalks. If DoBi operators are not complying with city regulations, then the city should not be afraid to issue cease-and-desist orders, as NYC did. In today’s volatile bike-share climate, an end state is difficult to predict. There are some nightmare scenarios. With around a dozen DoBi companies competing for market share, some will fail, like Bluegogo did. If DoBi undercuts municipal systems, like Metro Bike Share, then users choices could become very limited. As venture capital runs out, DoBi prices could go up. There are also positive scenarios. Responsibly-maintained DoBi operating alongside municipal bike-share could offer users a marketplace of options. 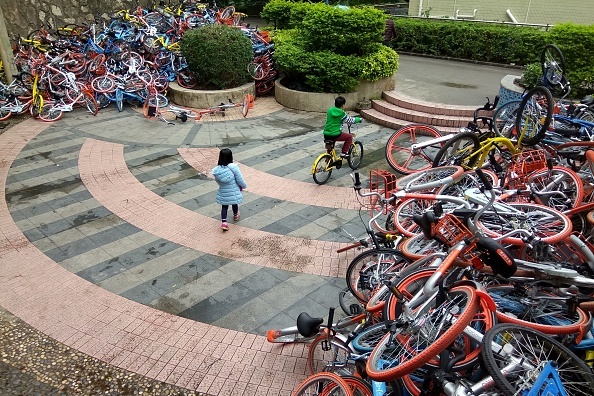 Streetsblog NYC reports that in Hangzhou, China, DoBi competition pushed the large, publicly-funded bike-share operator to adapt and improve its service. Lastly, as NACTO’s Fillin-Yeh emphasizes, bike-share of all stripes will work best in places where street infrastructure supports safe cycling. If Los Angeles streets remain as inhospitable and dangerous as they currently are, then bike-share providers will compete for a small constituency of strong and fearless cyclists. If L.A. leaders, including Councilmember Ryu, really want bike-share to succeed and thrive, then they need to stop impeding Vision Zero projects and build networks of streets that are truly safe for bicycling. That requirement to not operate where Metro bike share exists seems misguided and almost certainly impossible to enforce, and the “foreseeable future” part of it sounds awful. Are they going to tell riders not to leave their bikes Downtown? Good luck with that. Maybe Metro should actually expand their service in a sensible and expeditious manner if they want to be competitive. I don’t see the value in blocking people from biking to/from Downtown and being able to do so for $1 instead of $3.50. I get that there are technical ways you could do it, but… why? You’re just making it less convenient for the end user and more expensive for the operator. The current proposal refines specifics, and adds equity policies and pricing - it would apply to shared mobility fleets including DoBi, electric-assist bicycles, and electric scooters. T-Committee approved parking meter revenue return and funding to design an Arts District Metro station. DoBi regs are still in flux, returning soon. Initial fleet size will be 3000. Area restrictions have been eliminated, though fleet size incentives push devices to disadvantaged areas.